The school, represented by Mr. Mutoh who says splashed patterns, stripes and pongee are his life's work, houses tens of thousands of fabric samples - Isesaki, Yuhki, and Tatebayashi splashed patterns; Tatebayashi's Tohsen stripes; Kiryuu striped textiles from Meiji to Taisho; Isesaki, Matsumoto, Ueta and Gunjoh pongee; and Indonesian, Thai and Burmese splashed patterns and pongee. There are also handweaving tools and other items. The private school is a place for skilled textile designers, who use a large house in Umeda as a base for their ongoing research. At the July, 1990, Kiryuu City Studio Promotion Conference, the school was chosen 'best original studio' of all those in High Touch Design Park. 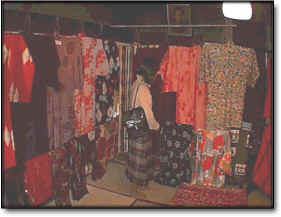 Exhibitions of textiles from northern Japan and striped work had been held up to that time. "The school is a place of knowledge and technique, but it is also a fun place ... If we can establish another mini museum in the city, then altogether we'll be like a big city museum", says Mr. Mutoh.